Bodø is located only 80 minutes from Oslo by air, and the transfer time from the airport to the city centre is just five minutes. The conference hotels are within easy reach in the centre, only a short walk from restaurants, shops and the Stormen concert hall and library. Go on a boat tour through the impressive archipelago, see the world's strongest maelstrom Saltstraumen, visit small fishing villages, hike up one of the 150 peaks that surround the city, go fishing on the open sea, kayak to a white sandy beach, play golf under the midnight sun, wander along the sea with a fishing rod. In the winter, you have a good chance to spot the northern lights. Bodø is also a great city for cultural events where art, poetry, sport, dance and theatre merge in a dynamite cocktail of extraordinary experiences. A violin conert at Mount Keiservarden, 366 metres above sea level? Rock music in the city park? Jazz at a café? Opera in a pub? Everything is possible! The new venue Stormen has quickly gained a reputation as a top-class meeting place for acoustic music performances for up to 942 people. Try local delicacies at one of the many restaurants in the centre or go for a more unconventional setting: Dine on the best local food you can imagine under the open sky on the beach, in a lavvo tent with a bonfire, in the historic setting at the National Aviation Museum, or on a private island with a huge seafood buffet. Bodø is the very much the transport hub of Northern Norway, with good connections from other parts of the country. The city is compact and easy to navigate – you can even walk from the airport to the city centre in just 10-15 minutes. The Nordlandsbanen railway goes from Trondheim to Bodø – enjoy the scenery at close quarters on the way. Prices and timetables are available at NSB (the Norwegian State Railway). Check information about local and long distance buses at 177nordland.no. Polar Tours offer bus rental for small and large groups - contact them by email at post@polartours.no. Hurtigurtens' northbound ships arrive in Bodø at 12.30 and the southbound ships at 13.30, every day. Travel time from Stamsund and Svolvær in Lofoten 4 and 6 hours respectively, from Tromsø around 24 hours and from the North Cape around 48 hours. 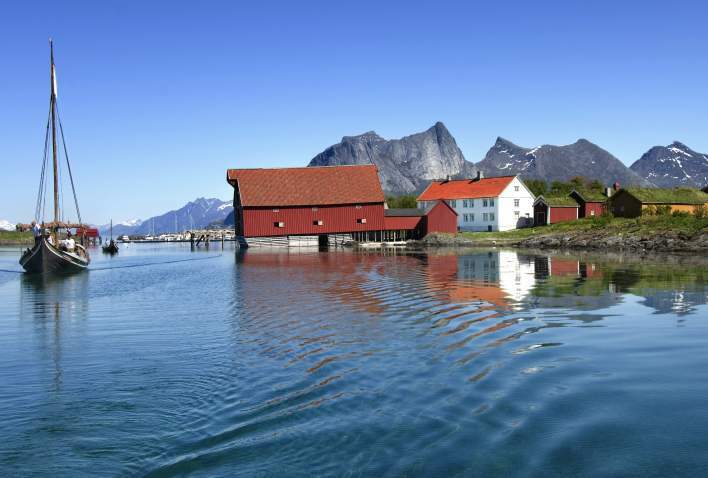 Fast passenger boats and car ferries take you from Bodø to several ports in the Lofoten Island and along the Helgeland coast. There is also car ferry betwen Bodø and Lofoten (Moskenes). Drive to Bodø on the E6 or along Rv 17 (the coastal route). Rental cars are available from avis.no and budget.no (website currently in Norwegian only). If you need a taxi, phone Nordland Taxi on 0047 07550. Remember to check the cost before you start your taxi journey. Bodø airport is situated only 2 kilometres from the city centre. Take bus service no. 05 to the centre, or walk! There are several daily flights to Oslo, Trondheim, the Helgeland coast, Lofoten, Tromsø and Bergen. The flight time between Bodø and Oslo is 80 minutes.